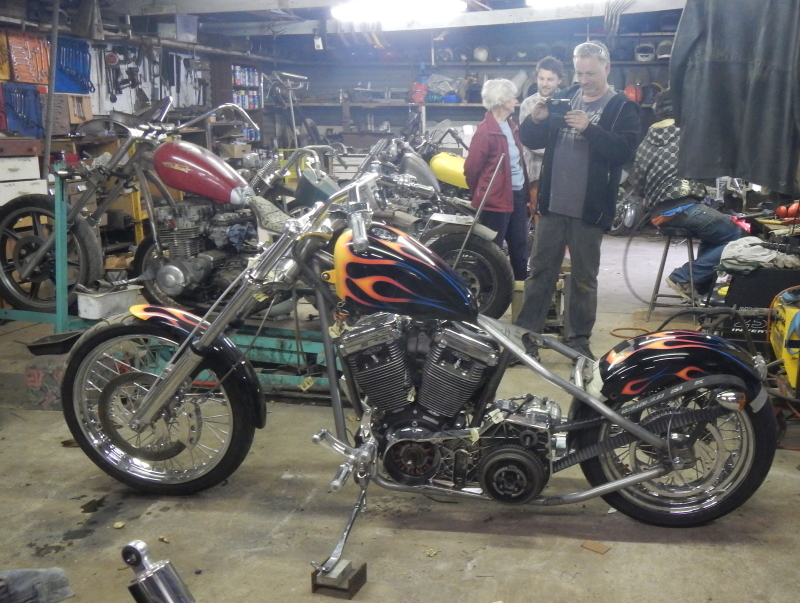 This chopper has been through a number of hands before Jason purchased it in Queensland. Problem in Queensland was, no import paperwork, therefore "No registration sir!" Consequently, he found me on the net and asked what could be done. 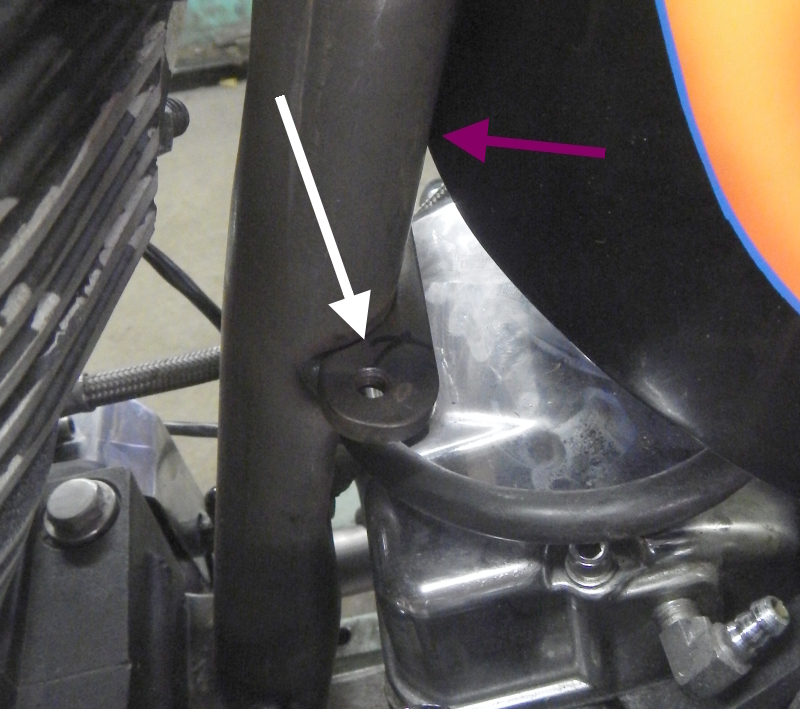 Unfortunately, due to the authorities' attempts to reduce rebirthing, a bike without paperwork for it's frame, cannot be registered in SA either (it's a federal issue)... a similar problem we have with the Triumph Thunderbird. 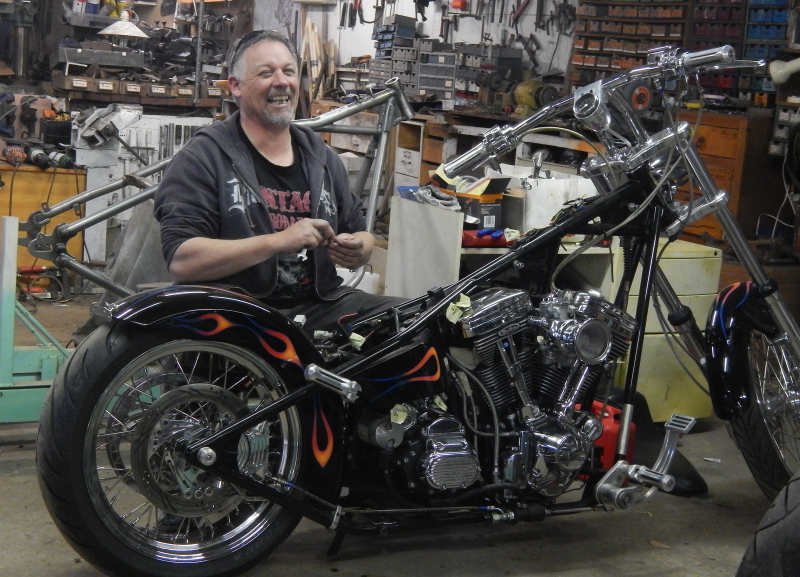 Jason rolled up on Wednesday and got straight into pulling more of his chopper apart. 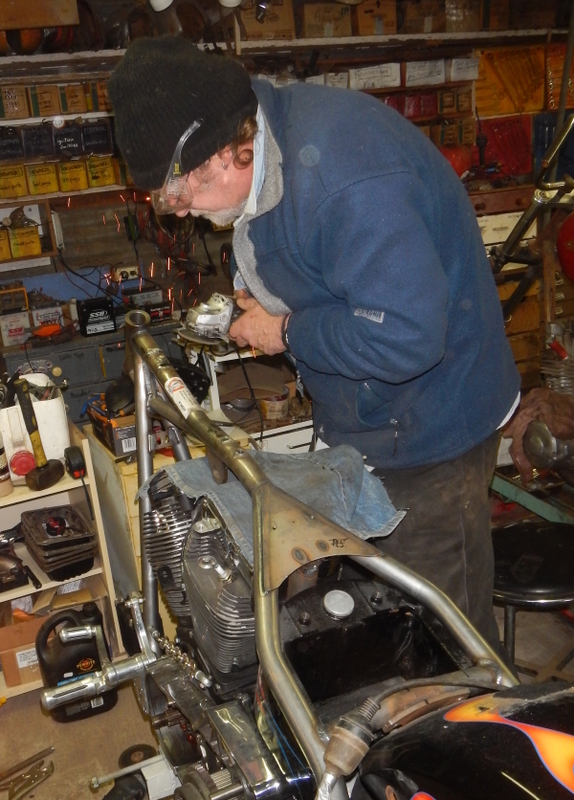 Jason hopes to be up on Monday and will check the oil tank for fit and then start cutting off brackets and then mounting the fuel tank. 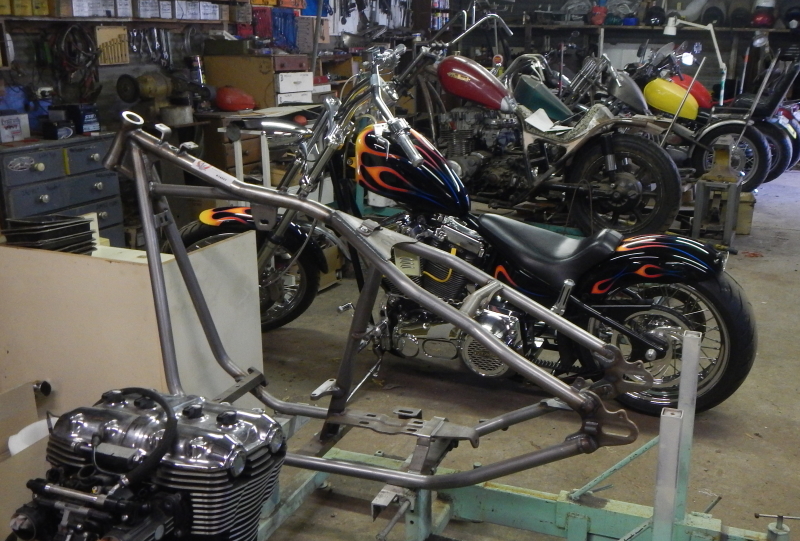 We will get all the components except the wiring loom mounted on the new frame and then dismantle and paint the frame. 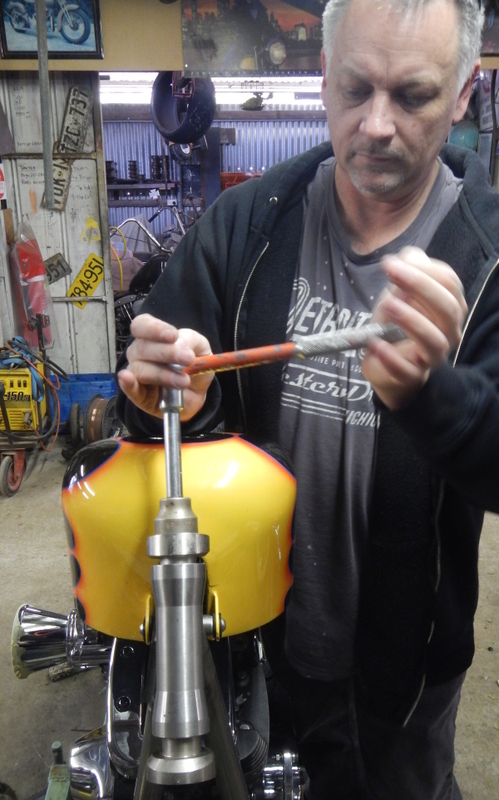 Jason is an ex panel beater/spray painter and has some cool ideas for his frame colour to complement the existing paint scheme on the rest of the chopper. 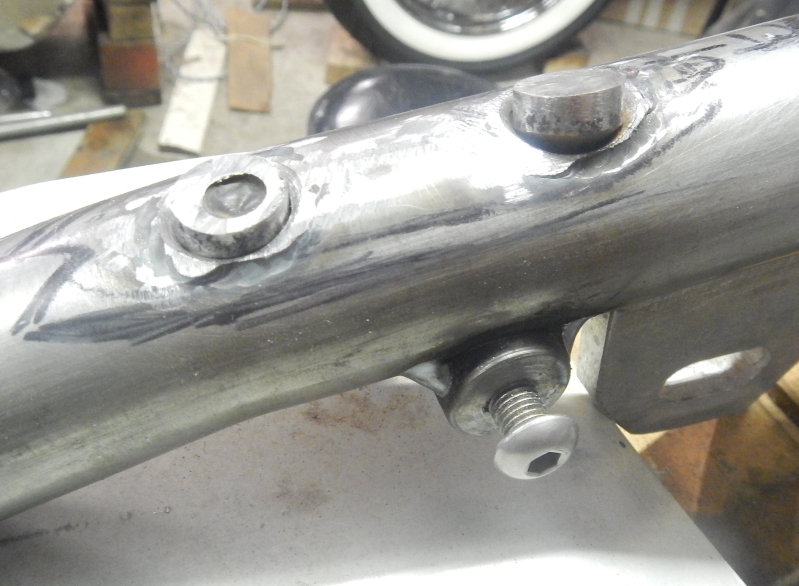 Can't see the threads very well, but can you use the threaded holes for jacking bolts? 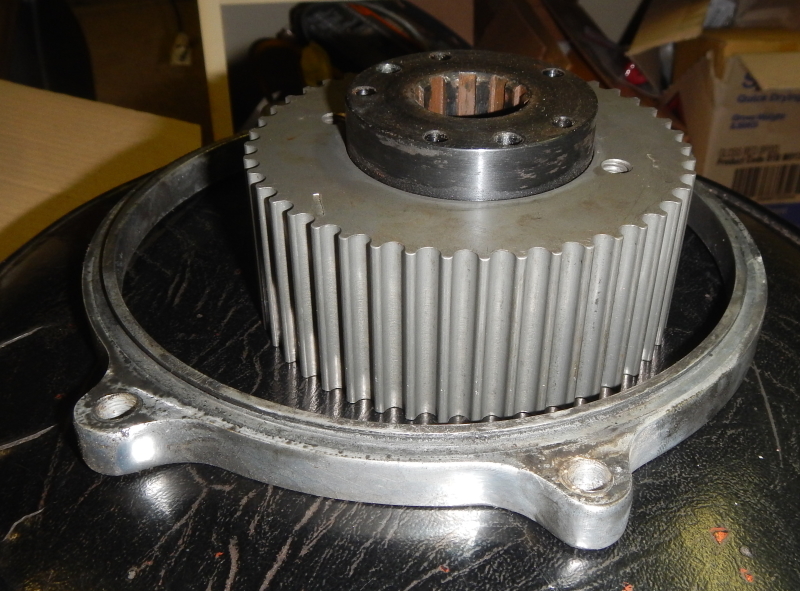 Place pulley in the freezer, or the oven? 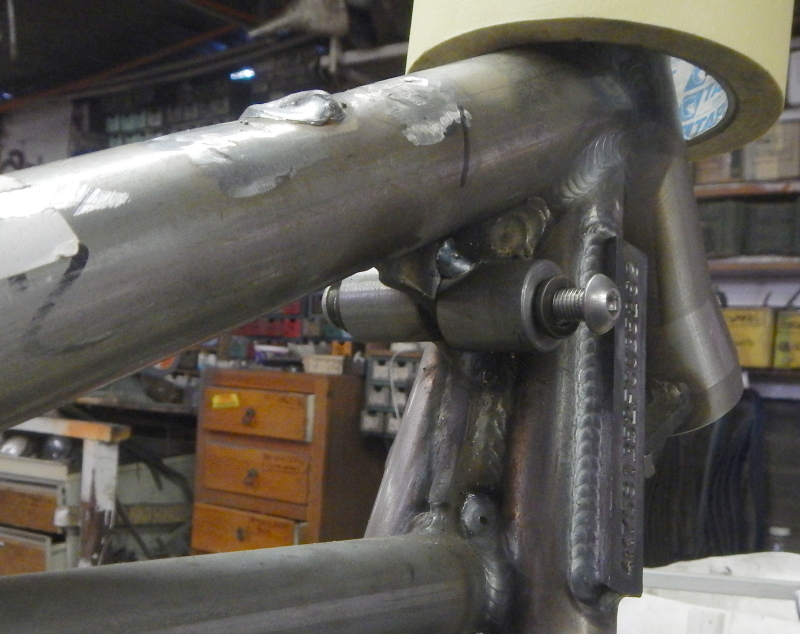 Can't get the bolts undone, so may have to drill them out. 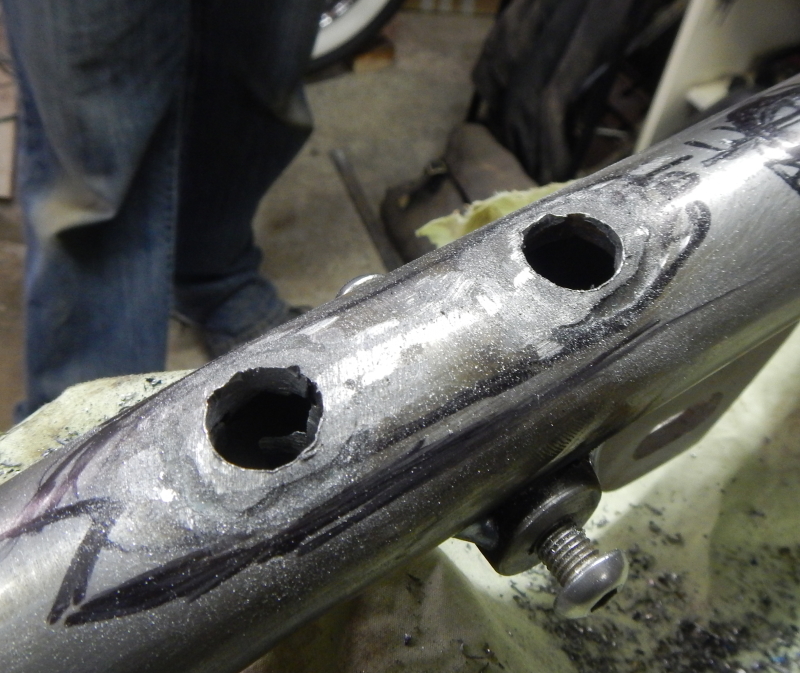 Try using a little heat, on the bolt. Oxy, Henrob it will soften the Loctite. 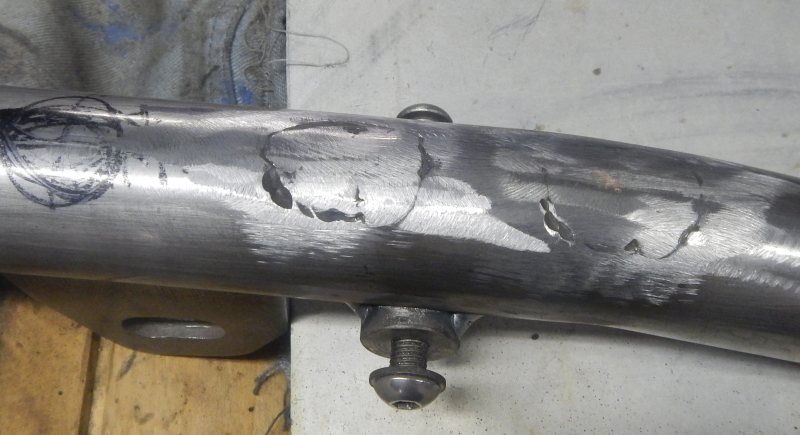 We heated up the bolts (counterbored ¼" socket head cap screws) first... which didn't work. 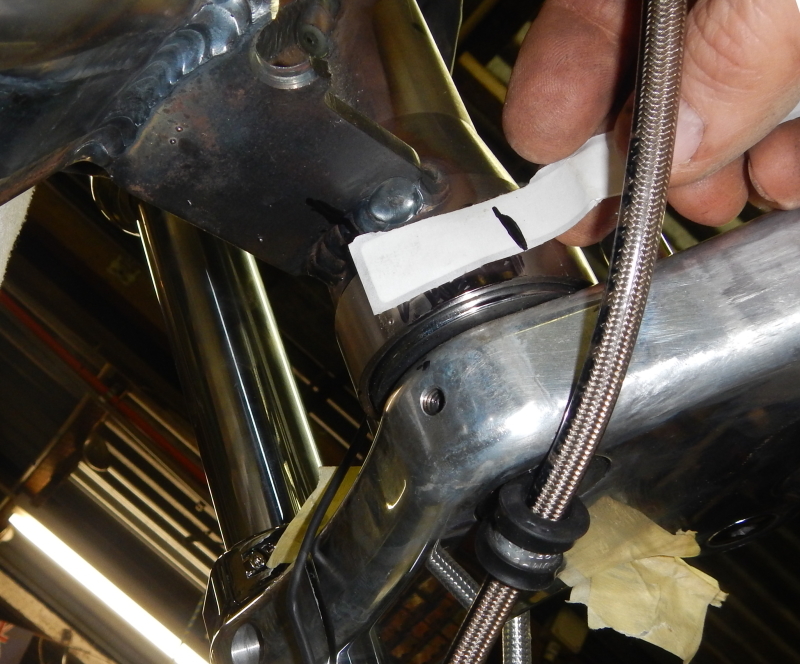 Then we heated u the hub... really hot without melting the alloy pulley... no luck! 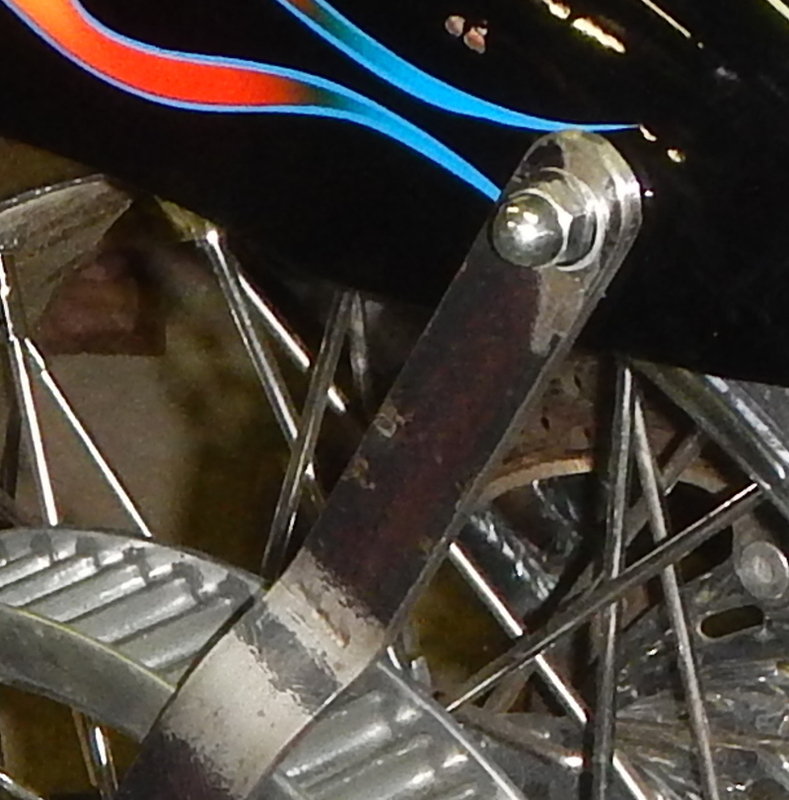 I am awaiting a reply from J&P cycles and also Cruiser Customising who both advertise Rivera Primo drives. K&M in Richmond SA have a 'battered' 45 toother for $20 so I'll get Jason to pick that one up just in case we can use it. In the meantime will see if the other suppliers mentioned can give us any joy. 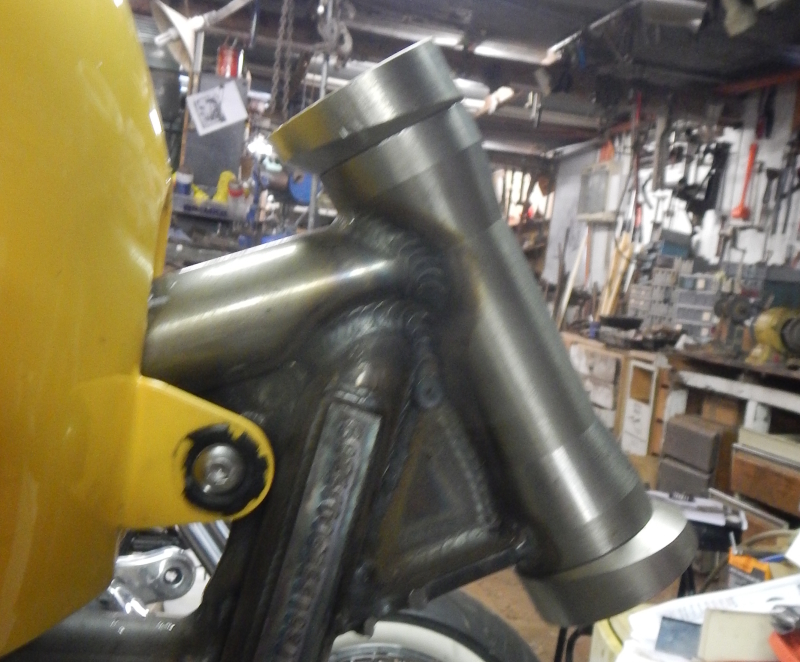 Jason has been working away on his chopper. 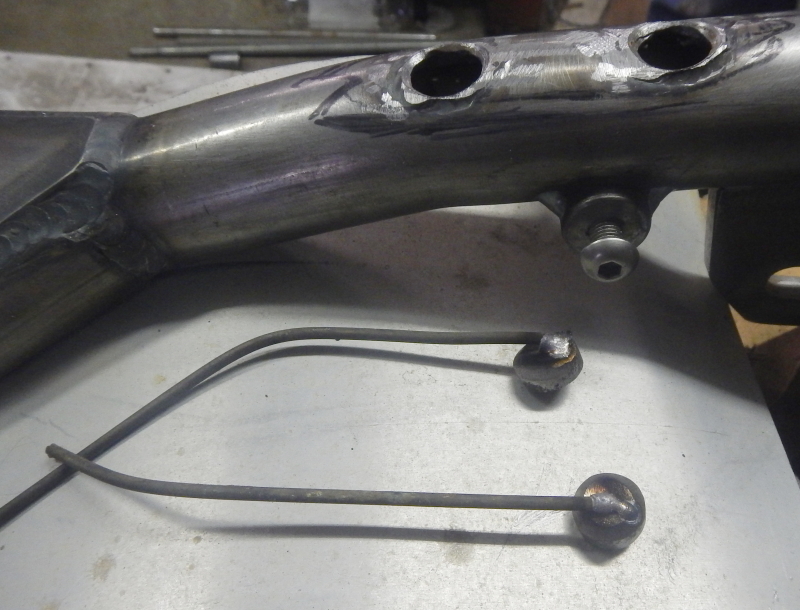 New holes were drilled in the guard to match the existing frame mounts. 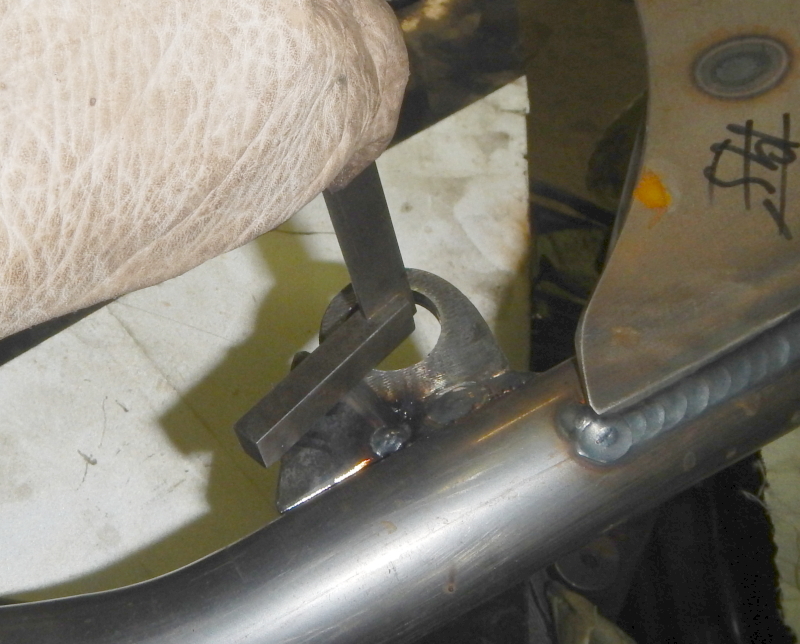 Rear guard brackets will be temporary for getting through Regency. 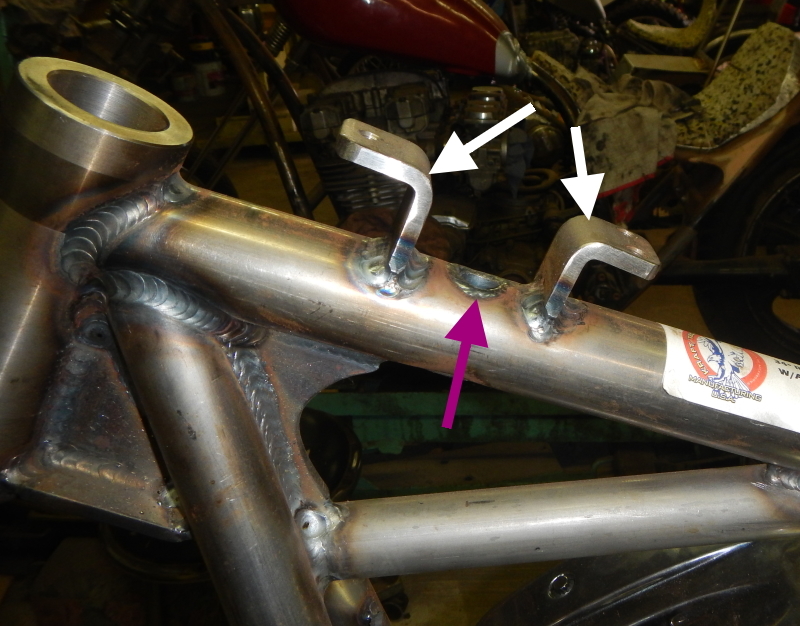 We'll build a sissy bar once registered. 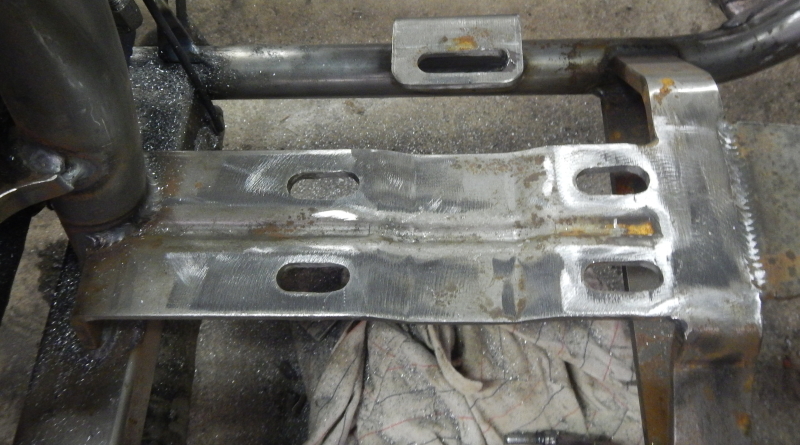 So these are fabricated out of 25 x 6. They will be painted. 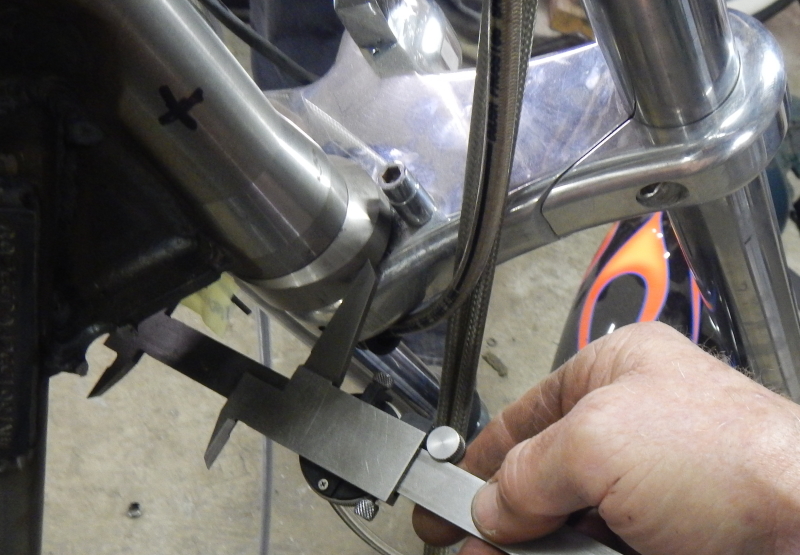 A couple of bends are needed on the left side to clear the belt drive pulley. 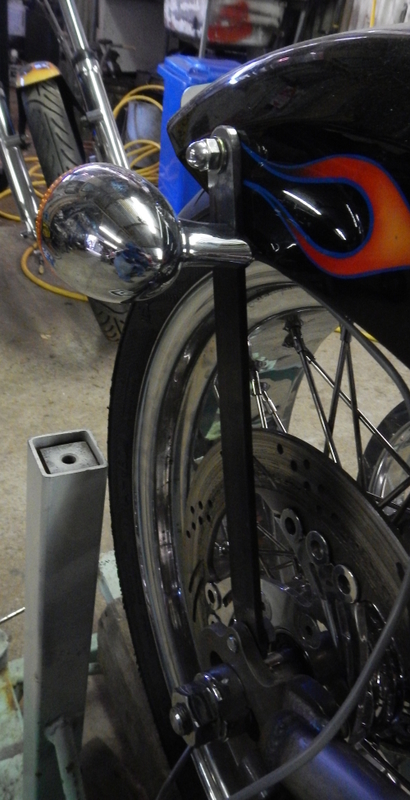 Taillight/indicators are off a current model Harley. Also a temporary mount. 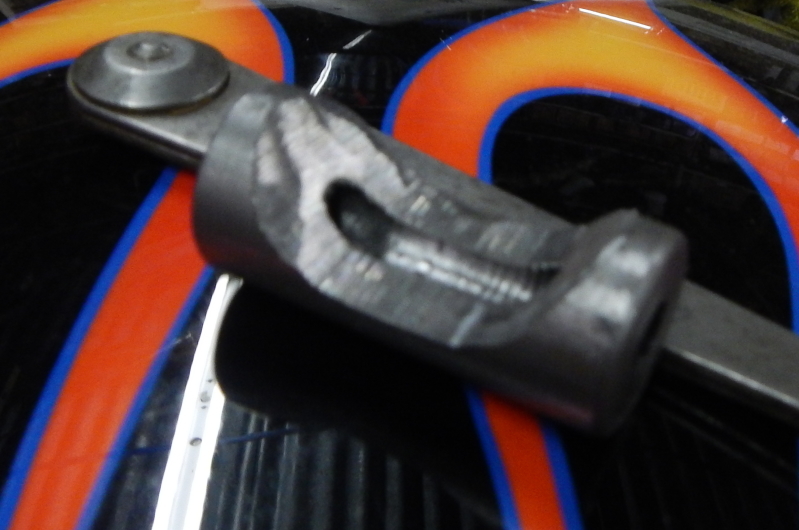 Jason spends some time trying different angles until he is happy with the look. 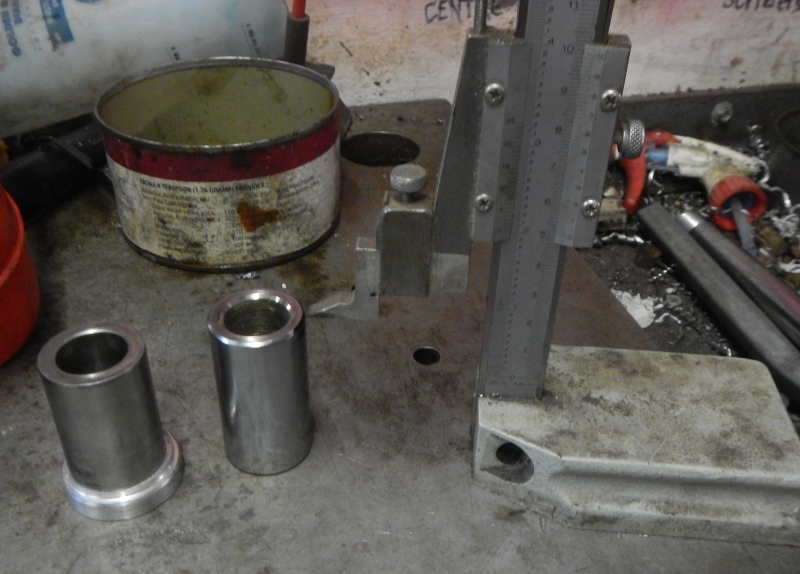 Front mounting is via a pair of 5'16" UNF threaded bungs we make up on the lathe. 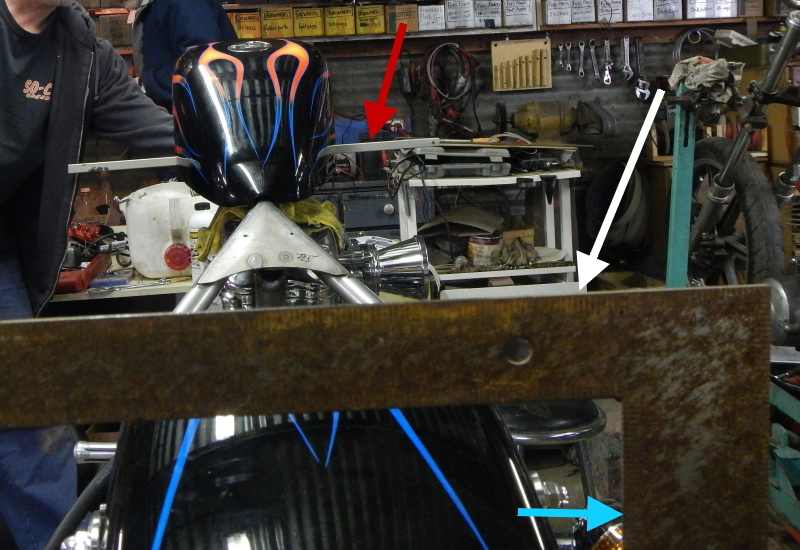 Tank level is found by setting up a carpenter's square (white arrow) on the side of the wheel (blue arrow). 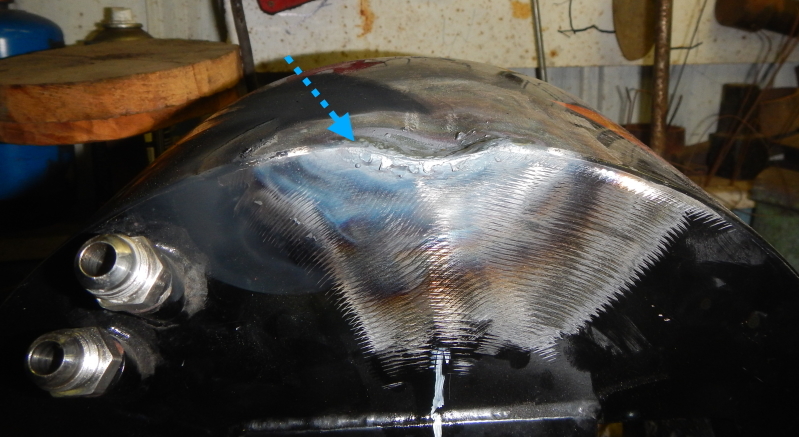 A straight edge (red arrow) is then set up on the bottom of the tank. 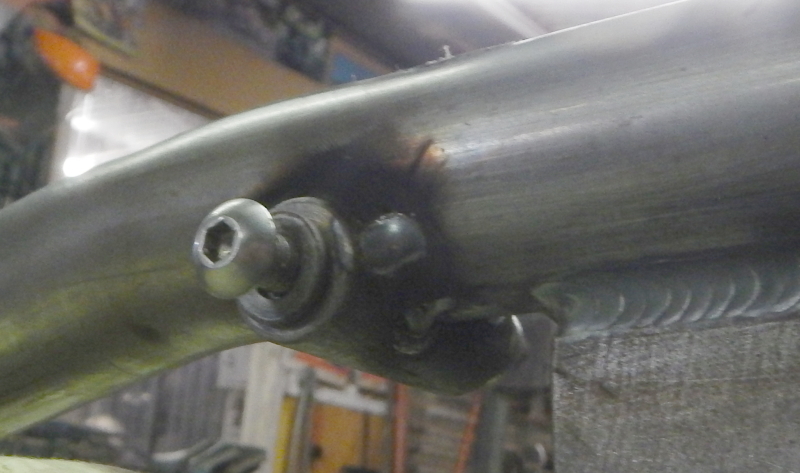 The two are aligned by eye and the bungs welded in. Light blue line shows depth of first cut. Red lines show 2nd & 3rd cuts. Dark blue line will be fourth cut. and so on. 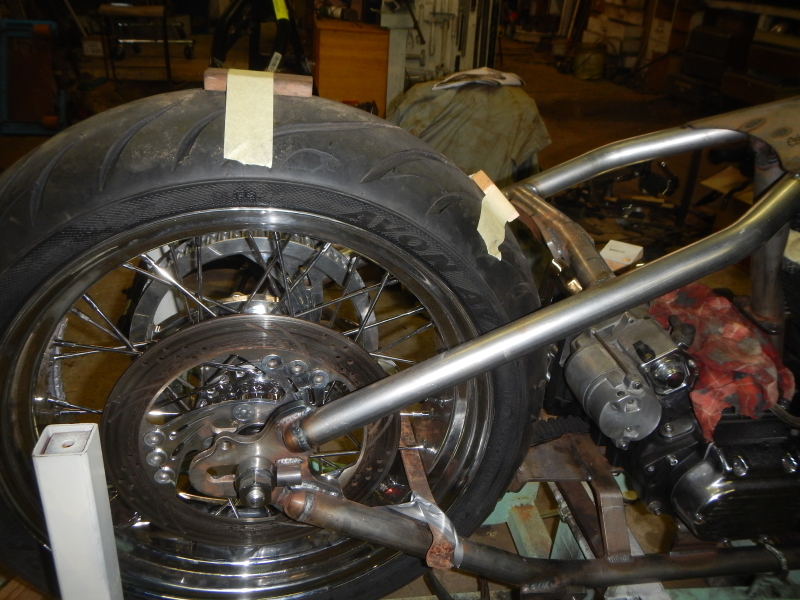 Round shape is finialy ground out with angle grinder. 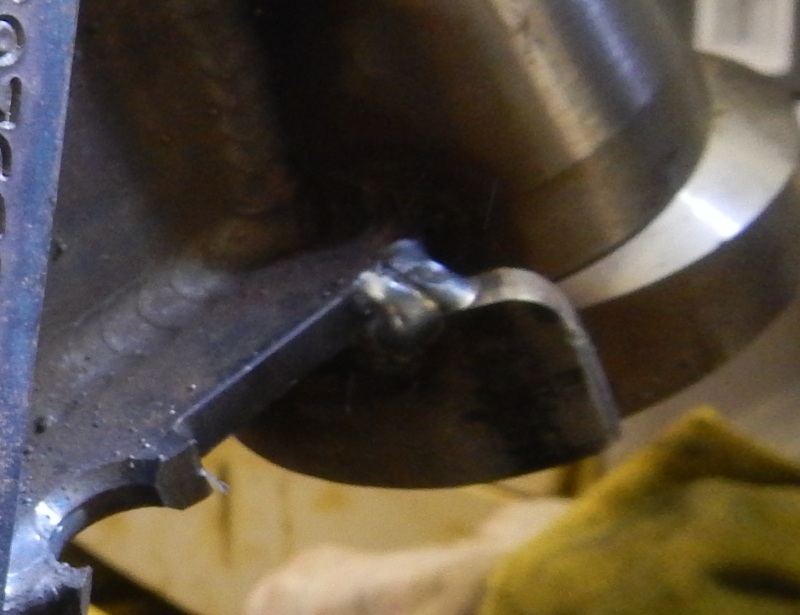 You can skip the milling by carefully cutting with 1mm cutting blade on the angle grinder. Mill just makes it more accurate. Forgot to take a pic of the tank mounted. Will do it tomorrow and put it in here. 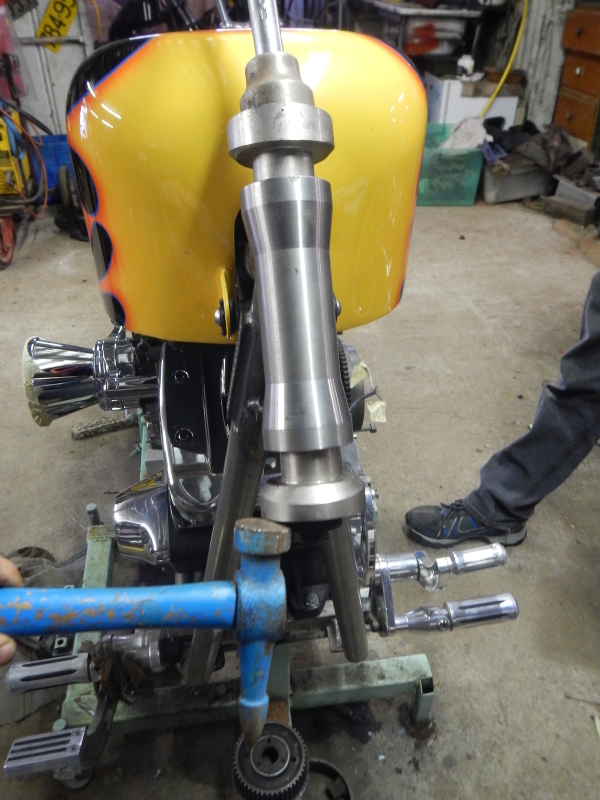 Oil tank, brake master cylinder and exhaust mounts next and then we'll install the front end and get it on the ground. Time to catch up on Jason's work. 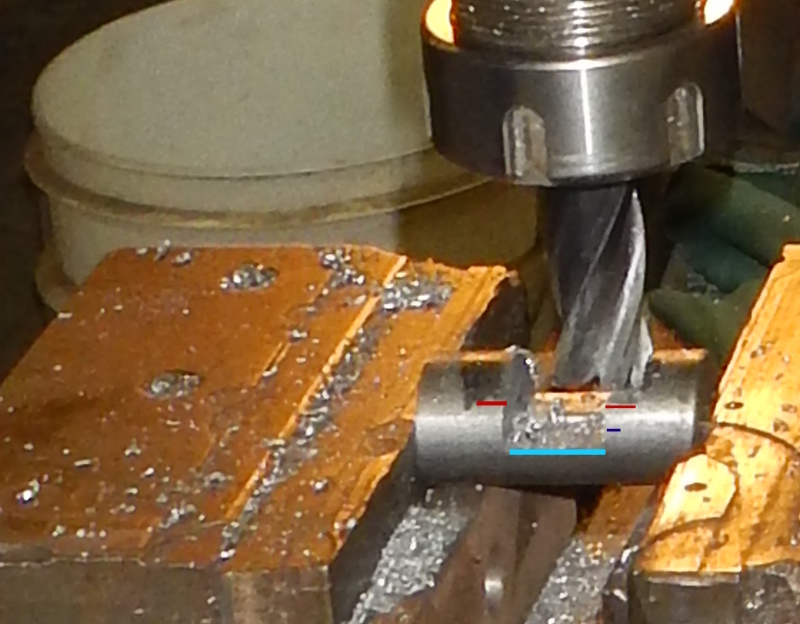 They are not strong enough for my liking, so we add in some small triangular sections. Straight edge is used to keep them in line. Now the exciting part. 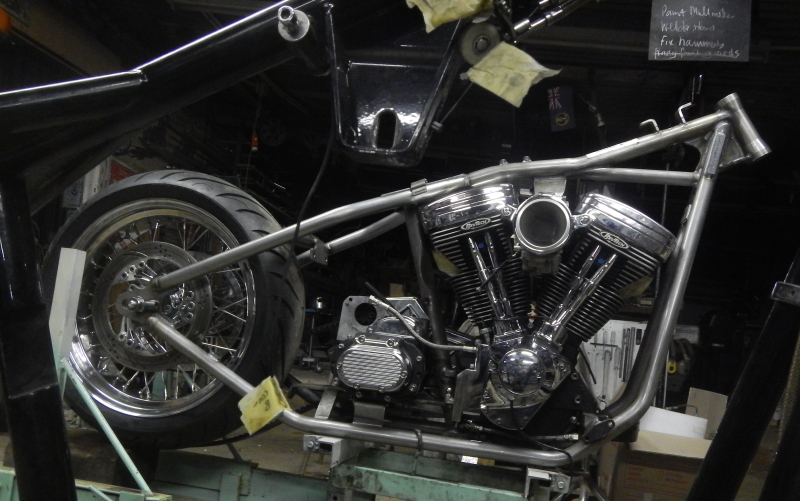 Installing the front end and getting the chopper on its wheels!!! Wow! Jason falls in love immediately. 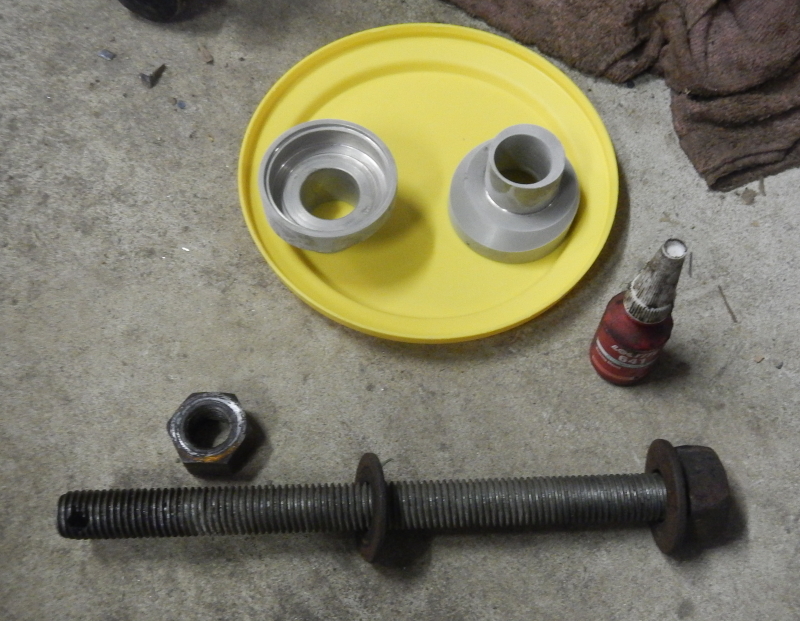 Now to measure up for steering stops. 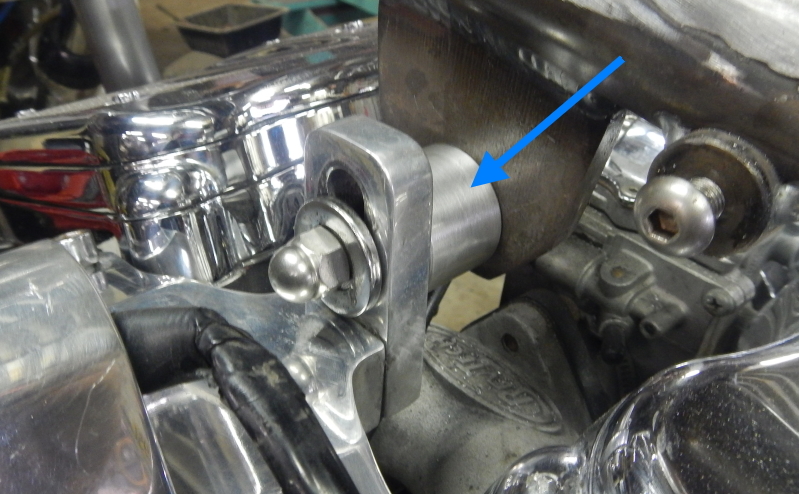 Using after market ones is not an option as Jason undertands my explanation that the more lock you can get with a long front end, the more manoeuvrable and easy to ride a chopper will be. 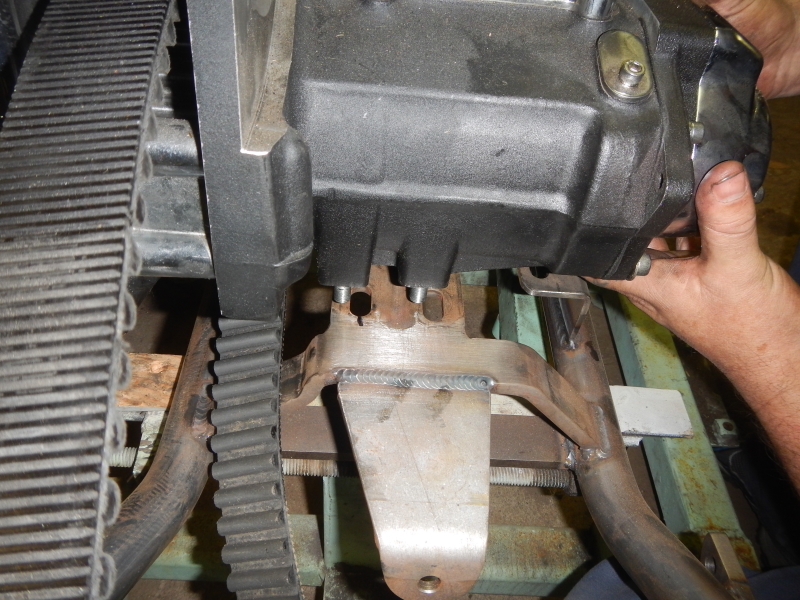 After a most frustrating and time consuming search Jason finally takes ownership of a non offset centre for the front pulley. 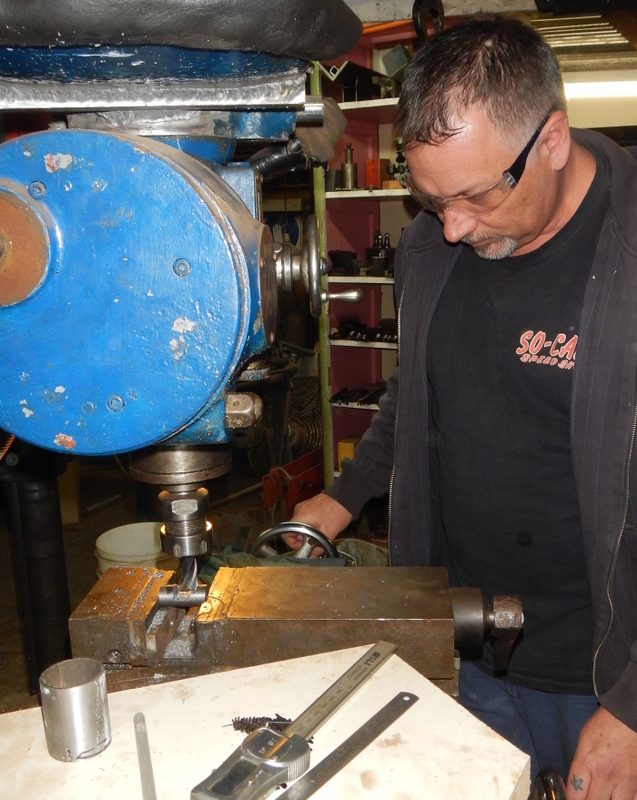 After trying every method under the sun, Jason drills out the old socket head cap screws. Now how hard will it be to separate the old centre from the pulley. Will this little press be ok? Well I'll be the damn thing falls out with no effort at all! 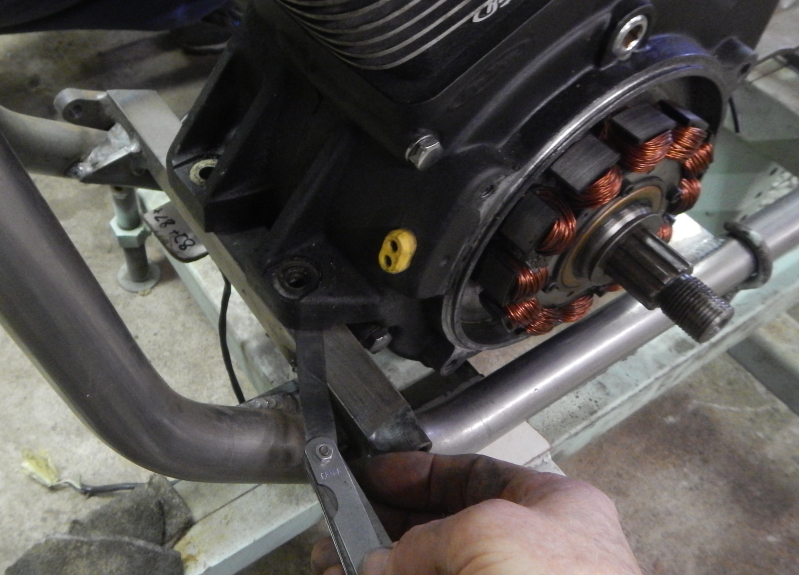 New centre is installed with new screws and slipped onto the motor. 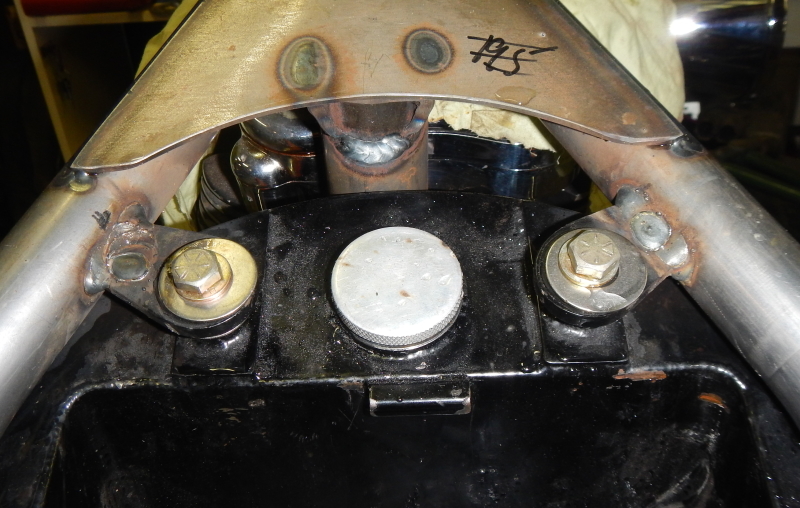 Gearbox bolts are very tight on the slots awhihc actually need to be lengthened about three mil. 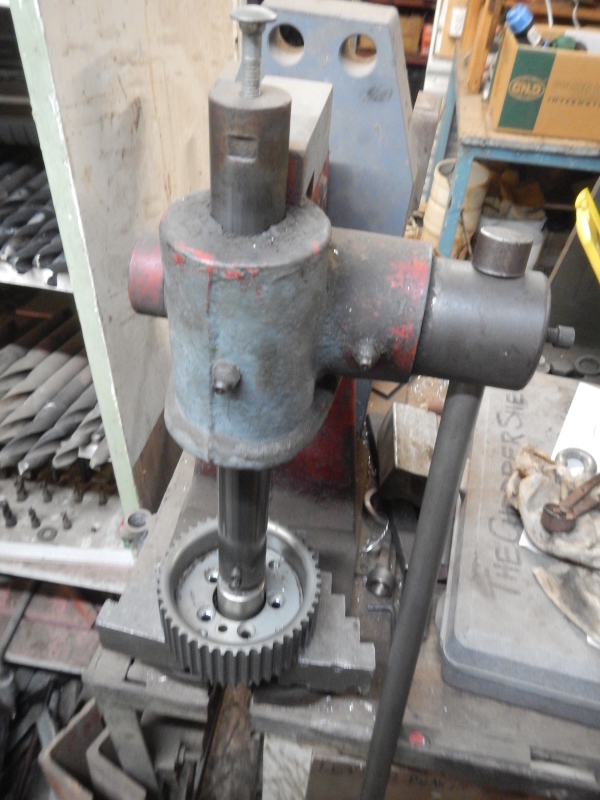 This is done with a die grinder and burrs are removed with a minibelt sander. 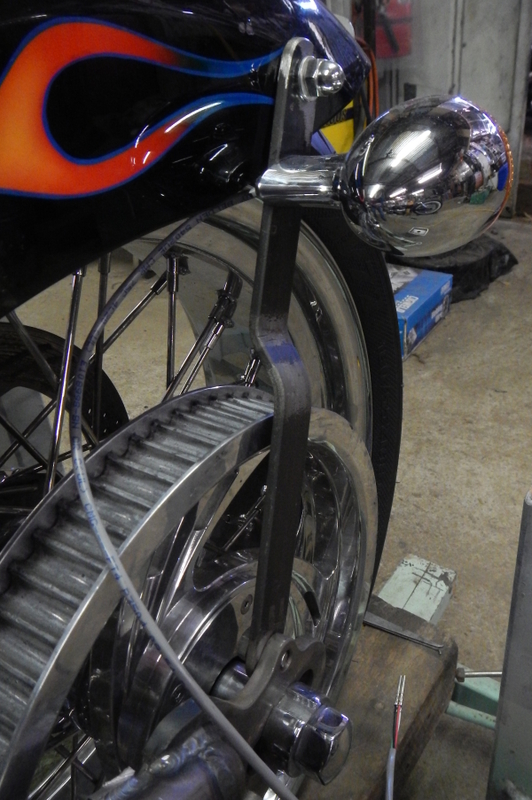 Tins have now been painted and frame got done today... more pics soon. This has been a good read so far, excellent work. I wouldn't mind knowing how much the whole exercise will have cost including frame, engineer and labor and any other cost. It would give people an idea on the cost if someone else wanted to go down that or similar path. Great read, and cool pics as always Prof. Glad you take the time to stop and take a photo of some of the work, as it really does say a thousand words. Jason is always smiling in all the photo's too.!! I'll ask Jason if he is ok with itemising the costs. 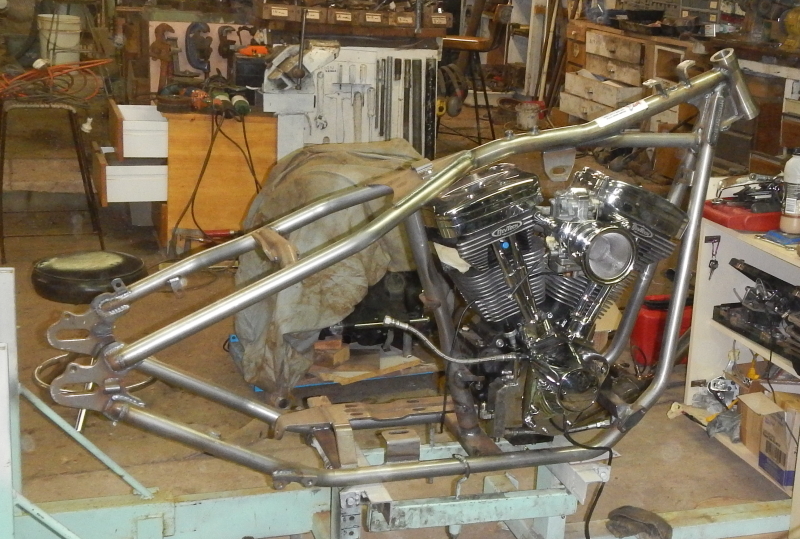 Jason got the frame painted last week and began assembly this week. I'll try to get you all up to date in the next few days. 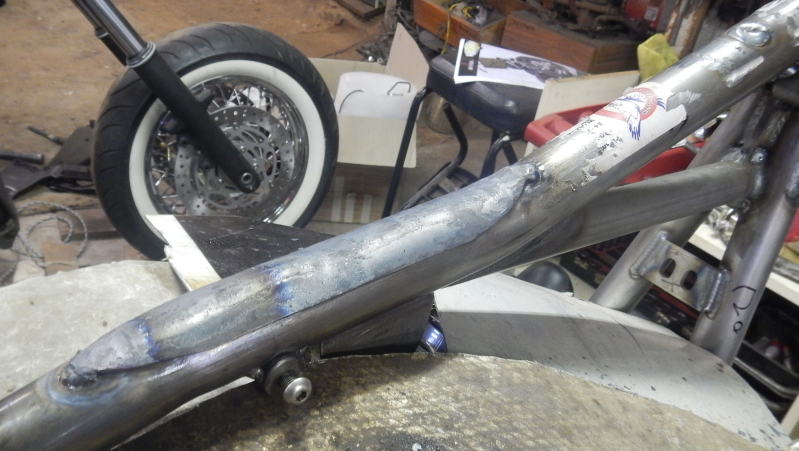 I also have major updating to do on Jett's kz750 and Terry's xs650... just rather short of time atm, but will get to them as time allows. 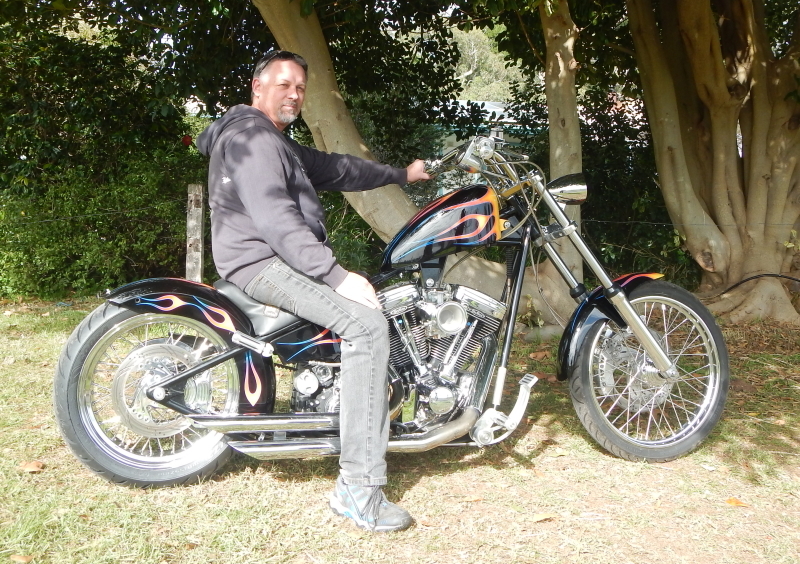 I still can't post photos, but Jason took his chopper for its first ride a couple of days ago. Now for final engineers check and then to Regency for Govt inspection. I'll get rest of posts on this build up when server gets fixed up.